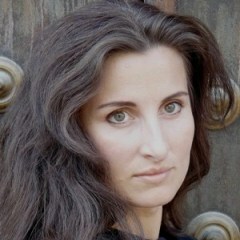 Karolina Gumos has been a member of the ensemble at the Komische Oper Berlin since 2006. Her repertoire in Berlin includes Octavian in Der Rosenkavalier, Idamante in Idomeneo, Hänsel, Rosina, as well as the Fox in The Cunning Little Vixen, Orlofsky in Die Fledermaus, Dorabella in Cosi fan tutte, Cecilio in Mozart’s Lucio Sila and Mercedes in Carmen. Also in Berlin, in the season 2013/14, she sung Charlotte in Zimmermann’s Die Soldaten and the Foreign Princess in Rusalka for the first time. Her roles in Berlin during the current season include: Der Märchenprinz in Cendrillon, Orest in Die schöne Helena, Zweite Dame in Die Zauberflöte, Donna Elvira in Don Giovanni, Olga in Jewgeni Onegin and La Muse / La mère d’Antonia in Les Contes d’Hoffmann. Karolina Gumos was born in Gdynia (Poland). She studied violin before turning to singing. After successfully completing her studies at the Poznan Music College with Prof. Wojciech Maciejowski in 2001, she continued advanced studies with Prof. Anneliese Fried at the Hanns Eisler School of Music in Berlin. Whilst still a student, she performed frequently in oratorios by Bach, Händel, Mozart and Pergolesi. Karolina Gumos has participated in several master classes, as well as in numerous radio and television broadcasts (ARTE, ZDF in Germany and Radio 1, Poland) and has been a prize winner in the international Ada Sari Singing Competition. 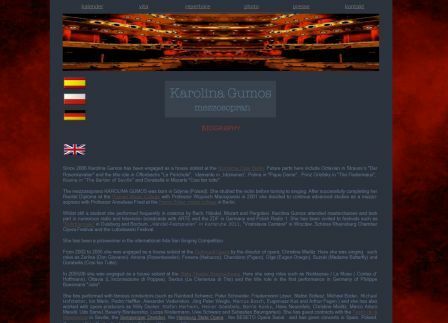 From 2002 to 2005 Karolina Gumos was engaged at the Dortmund Opera, where she sang roles such as Zerlina, Fenena, Cherubino, Olga and Dorabella. In 2006 she joined the State Opera of Braunschweig, where she added the roles of Nicklausse / La Muse (Le contes d´ Hoffmann), Ottavia (L´incoronazione di Poppea), Sesto and the title role in the German premiere of Philippe Boesmans’ Julie to her repertoire. She has appeared in concerts and guest performances at the Teatro de la Maestranza in Seville, Semperoper Dresden, Hamburg State Opera and Beseto Opera Seoul, Korea. Karolina Gumos has also been invited to festivals including the Ruhrtriennale (F. Martin Le vin herbé 2008, Schönberg Moses und Aron 2009), Munich Opera Festival (Das Lied von der Erde 2010), Musica Mallorca (Operngala 2007), Vratislavia Cantans in Wroclaw (Bach Magnificat), Schloss Rheinsberg Chamber Opera Festival (Le nozze di Figaro) and the Lutoslawski Festival, Warsaw. At the Händel Festival at the Badische Staatstheater Karlsruhe 2011 she enjoyed a special success in the role of Rosmira in Partenope. Karolina Gumos has performed under the batons of famous conductors such as Peter Schneider, Friedemann Layer, Stefan Soltesz, Michael Boder, Ion Marin, Pedro Halffter, Alexander Vedernikov, Jörg Peter Weigle and stage directors including Hans Neuenfels, Christine Mielitz, Marco Arturo Marelli, Udo Samel, and Willy Decker. Karolina Gumos, La Muse / La mère d’Antonia in Les Contes d’Hoffmann live stream.